Why Leave It Undefined? - READY... SET... QUESTION! Evolution is a term that most people believe they understand. The most simplistic way of describing it would be, “change over time.” Yet, is this sufficient? Do seasons evolve? What about trees loosing their leaves in the fall and then growing new ones in the spring, is that evolution? 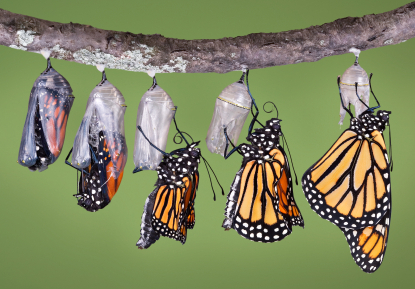 What about a caterpillar metamorphosing into a butterfly, is that evolution? The Grand Canyon was a plateau and now a river has cut through it getting deeper every year… is that evolution? What about things we humans have made? Has hunting technology evolved?.. Irrigation methods?.. Food storage and production?.. Transportation?.. 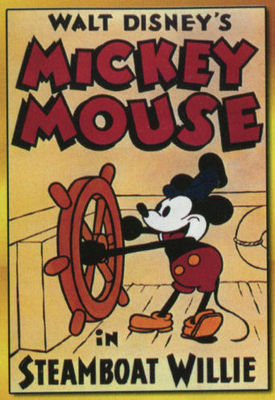 Communication?… Technology?… What about Mickey Mouse in Steamboat Willie compared to the computer generated version in today’s Mickey Mouse Clubhouse? Evolution has been left wildly ambiguous. It seems the idea of evolution can be used in just about any context. Yet, when evolution is used in describing the “how” of life’s diversity, including the emergence of our species, the conversation feels much different. Why is that? Why can we chat openly and freely about the evolution of the baby bottle or the soda bottle… or the evolution of funding the new space race, but when evolution turns to biology and the emergence of life’s diversity, the conversation becomes far less open and free. It is obvious that evolution can mean different things. Many illustrators, drinking coffee into the wee hours of the morning might protest that seasonal leaf production among trees is not the same thing as producing an animated series for Disney. The non-biological process of water eroding our nation’s most famous canyon is different from a fat caterpillar instinctively metamorphosing into a butterfly. Of course, there could be some strange instance, but I am assuming no one has ever gone to court over the teaching of butterfly life cycle… Or no one has ever sued a school district because Steamboat Willie was played in a film history class. Why? We understand that “change over time” is not the best description of what Charles Darwin made famous. He wrote the Origin of Species and attempted to explain how life’s diversity emerged. This type of evolution is what strikes a chord in people. So, why leave evolution undefined? Why make it part of the required educational framework from federal standards, to state standards, to district standards and leave the term open for interpretation? Could it be that we all know that mostly positive feelings come from the mentioning of butterflies, trees, Mickey Mouse, and the Grand Canyon? If these things experience evolution, then biological evolution seems to be just as worthy of positive/happy feelings, right? Only close minded and strange people are opposed to things that generated positive/happy feelings. I’m not sure what the reasoning or the motivation is for our educational system and the evolutionary community to avoid the crafting of a concise, consistent, and scientifically agreed upon definition of evolution, but we need a definition. In my book What Is Evolution?, I dive deep into the reality that such a contentious idea is undefined and I ask many other questions that need to be addressed. Previous PostScience or Pseudoscience?Next PostDoes evolution have a mountain of evidence?